Aiko Herzig Yoshinaga and the late Jack Herzig. The UCLA Asian American Studies Center was awarded a $154,960 grant from the National Park Service, Department of the Interior, through its Japanese American Confinement Sites (JACS) Grant Program. The program supports projects in seven states to help preserve and interpret sites where Japanese Americans were imprisoned during World War II. 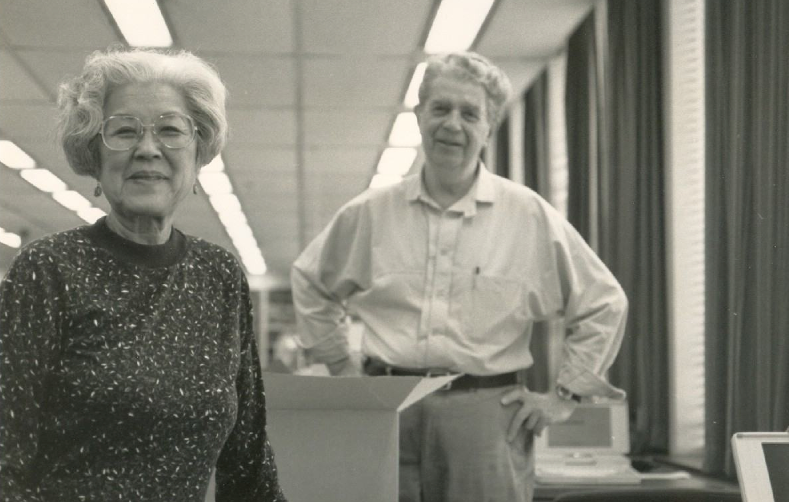 The center’s two-year award will support in part the processing, cataloging, and preservation of the Jack and Aiko Herzig papers. “The generous funding from the National Park Service will allow us to preserve more than four decades of research and primary materials pertaining to the World War II incarceration of Japanese Americans,” said David K. Yoo, professor and director of the AASC. When the project is completed, the Herzig Collection will be transferred to the UCLA Charles E. Young Library Special Collections for permanent archival storage and research access. Community workshops and outreach programs will be held to disseminate information about the collection and how it may be accessed. “The collection will not only enhance public knowledge about the unjust mass removal and incarceration of 120,000 Japanese Americans during World War II, but also offer invaluable lessons to anyone vitally concerned with issues of social justice in America,” stated Marjorie Lee, librarian and archivist for the AASC. In 2006, Congress established the JACS Grants program, authorizing up to $38 million in grants to be administered by the National Park Service. The goal of the program is to teach present and future generations about the injustice of the World War II confinement history and inspire a commitment to equal justice under the law. Successful proposals are chosen through a competitive process that requires applicants to match the federal grant award with $1 in non-federal funds and “in-kind” contributions for every $2 received in federal money. Since 1969, the AASC has been engaged in research and documentation of Asian American and Pacific Islander communities past and present. Continuing into its 45th year at UCLA, the center forges community partnerships through its students, staff, and faculty to bridge its research with community; supports innovation in education and research; and advocates for archival preservation of its cultural heritage and neglected histories. For more information about the center, visit www.aasc.ucla.edu. For questions regarding the JACS grant program, contact Kara Miyagishima, NPS program manager, at (303) 969-2885 or visit http://www.nps.gov/JACS.